One tidbit about Elton John that a lot of his fans are aware of, is that he is an incredible fan of music. His collection of other people's music has always been staggering in terms of volume, and seems to reach across multitudes of styles and genres. It's not that difficult to see, then, why he would attempt such a project as this one, being that he's now in the creative stage of "doing what he wants". 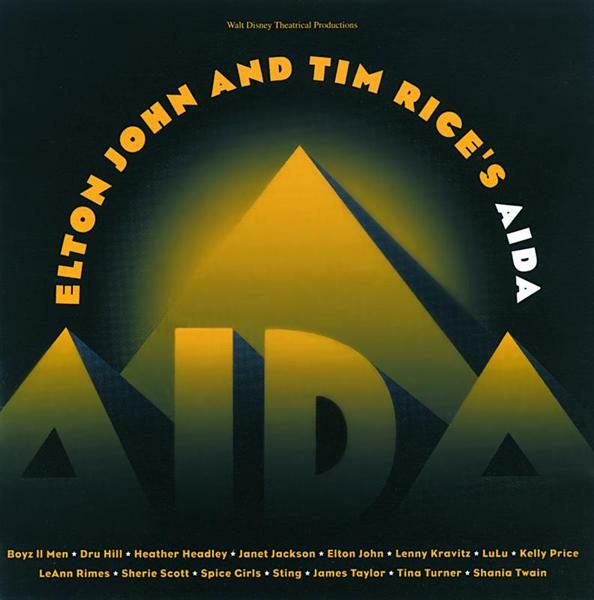 He again collaborates with lyricist Tim Rice, and, rather than do another soundtrack to another movie, he and Rice compose pieces around the famous Opera Aida (for novices, it's pronounced i-ee-da). Because of his love for other artists, he uses masses of them to perform on this project, and he, himself, is only featured sparingly. Sadly, this is where the problem lies. All of the songs are good, and all of the artists deliver as expected, it's just that there's too many styles of artists here, and just because Elton may be a fan of some of this music, most of his record buying fans probably are not. I can't really imagine many Elton fans being admirers of Dru Hill and/or The Spice Girls. Then there was the strange situation that this production never was really intended in a visual sense, so it's not like there was a movie or a musical (there would be, several years later) to tie this release to, so the whole thing never really had much of a foundation to stand on in the first place. If you search hard on the internet, you can uncover this album in demo form, with Elton doing all (or most) of these songs by himself. Not surprising, it's about one thousand times better. Expect (and/or hope) that those songs get officially released one day.